Mechanic's Assistant: What is the make/model of your '09 car? Hello my name is***** am sorry for this issue with your 2009 International, hopefully we can work together to fix this problem and get you back going. Have you checked the oil pressure sensor? May I have your vin number to retrieve the correct service manual for your vehicle? Also what code are you getting? I understand, have you measured the oil pressure? Does this vehicle have a davco filter? It is an auxiliary fuel filter with a large bowl that is overhead instead of underneath. Thank you for that information, you stated you replaced the sensor on the back of the pump correct? Well the bus switch off going down the road and we had to get it towed to the shop and I can not even get the bus to crank to see if it skeeps and I cleared the code out when I first got to it on the side of the road and it has not come back the only on that is in it now is low icp. Just to be clear did you test the oil pressure after the bus stopped running? The ports in an injector isn't large enough to cause a dramatic drop in pressure, it is more likely a line to the injector is pinched or the line is clogged for the oil supply , causing the pressure to be high but a low volume of oil , not allowing the injector plunger to pressurize quickly. Have you replaced the inlet filter? Hello: I'm Lindie, the moderator for this category. I'm so sorry that another Expert has not connected with you yet. I wanted to reach out to see if you still need assistance with your question? Please use the reply box below to let me know if you'd like to continue or cancel. Thank you! Hi, My name is***** will be glad to help. We can follow up as needed on here, Give me some time to review your information and follow up with my responses. Professionals are not employees of the site but users of the site and help on here as time allows in between jobs, family, etc. Response time can vary depending on my work load each day but I will always respond back on my next available login. Feel free to respond back at anytime if for any reason we seem to get separated, for status, etc. As I'm sure you are aware, your ICP fault code is for low injection control pressure. It has nothing to do with your instrument cluster. There is no indication of anything you posted that is connected to your instrument cluster in any way. Please disregard that to avoid any confusion on troubleshooting. Low ICP pressure can be caused by a faulty IPR valve, leaky injector O-rings or leaks in the high-pressure rail, faulty HPOP pump, faulty ICP sensor/wiring harness, etc.. Pressurize the ICP sensor port with shop air to check for leaks around the injectors in the high-pressure rail. If none found, test pressure with a 5000 PSI gauge at the sensor port. You should see around 870 PSI while cranking. You should also see up to around 4000 psi with 12 V applied to the IPR valve to read full pump output pressure. 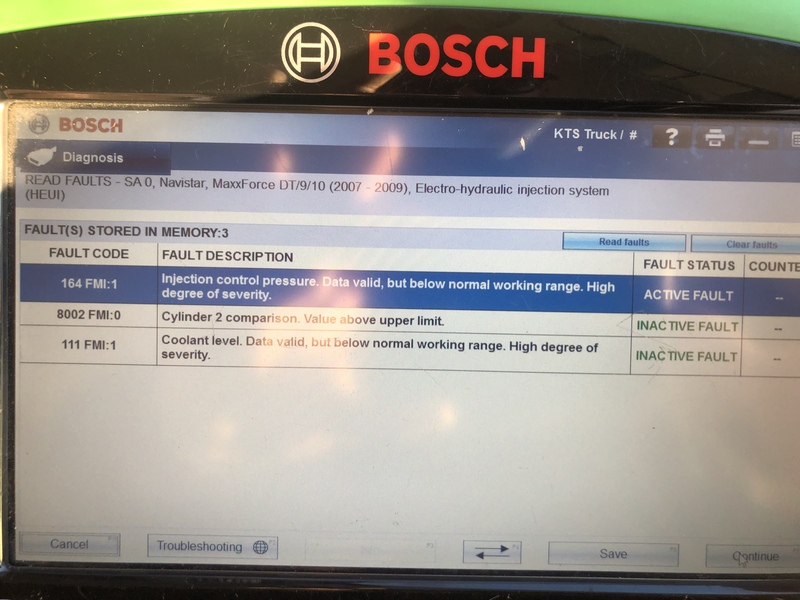 With the ICP sensor disconnected, your ECM should go into a default settings mode and if the sensor is bad, it should start on those default settings that would indicate a faulty sensor. The sensor is good, verify good fuel supply pressure and ICP pressure as I just mentioned. It is a pleasure to help anyway I can. 2004 E-450 Diesel 6.0. Ran out of fuel. Put fuel in tank.